Using Pyrex cupcake tin (only good kind I could find in Stockholm so far), the recipe yielded 24 cupcakes. The recipe was meant to make 12 muffins, however this is with a larger size cup, so I was expecting 18, and was pleased to get to 24 cakes that filled their cases. I did not mash the bananas too thoroughly, so cakes took around 26-29 minutes to cook thoroughly. I ran out of filmjölk (Swedish substitute for butter milk), so topped up with whole milk (approximately 2:1). First batter, I accidentally put the vanilla extract in with the dry ingredients, rather than the buttermilk-egg mixture, however I do not feel that it had an adverse effect on the results. I mixed the caster sugar and ground cinnamon together (approximately 4:1) in a little bowl for an even topping. 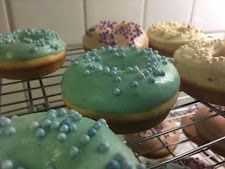 I preferred the cakes that had the topping put on just before baking as opposed to the ones that were topped and had to wait before their bake. Ran out of cupcake cases, so made two mini loaf-lets, using 'free standing' cardboard cases. The cases were over full (perhaps 1 cm left after the batter went in), and consequently the cakes spread into a more comical rotund shape. Next time I use such cases, I will place them in a baking tin to prevent the spreading effect. Loaf check @ 72 minutes - oops! Forgot to put the timer on. The skewer is not coming out completely clean, however I think that is down to the banana, plus I am tired, so I am taking it out. It will have to do. Will cool over night, and wrap in foil to take to work for fika tomorrow. It will be eaten either way! The loaves were a disaster. There is far too much banana in there to bake properly in this format.